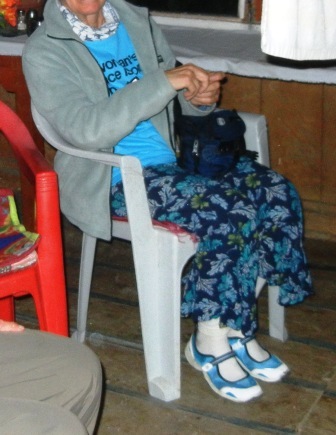 In general, women in the rural areas of Nepal dress very conservatively, with long sleeves and long skirts being the norm outside of Kathmandu and Pokhara. 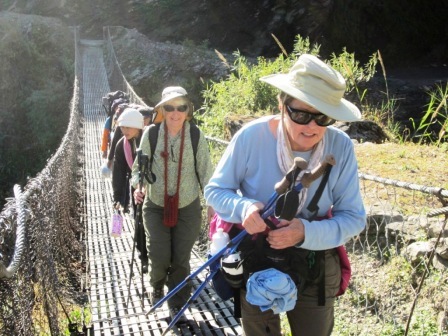 Nepalese who run guest houses and other tourist services on the Annapurna circuit have become enured to seeing women in trousers, but bare shoulders and short shorts will draw unwanted attention. Two pair of many-pocketed hiking pants – the kind with zip-off legs is good, although I never used that feature. I had only one pair which I wore for 11 straight days of hiking – by the end of the trek they could stand on their own. A brimmed hat. A baseball cap will not be enough to protect your nose and neck at high altitudes. Make sure the hat has ties for under the chin – a brisk wind can carry off your hat in the moment it takes to shift a trekking pole to your other hand and try to grab the hat. Lots of layers of clothes – short sleeve T’s, long sleeved T’s, preferably wick-away material that keeps moisture away from your skin. A water-resistant lightweight wind-breaker with a hood and lots of pockets. A fleece jacket. A change of clothes for evening. I gained a new understanding of the rational behind the old tradition of “dressing for dinner.” If you have been walking all day, if the shower has only cold water and the sink is for public use in the courtyard, , it is still amazingly refreshing to put on something different, even if the skin underneath is un-scrubbed. My evening outfit consisted of clean undies, my long johns (top and bottom) and a long skirt, with a T-shirt on top. After dinner I could just take off the skirt and shirt and hop into my sleeping bag. A change of shoes. Your feet will thank you if you let them escape the hiking boots for more flexible footwear at the end of the day. 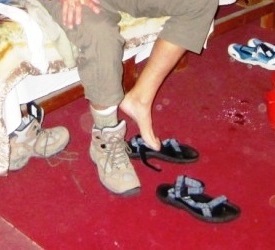 Thong sandals are useful for getting in and out of a wet-floored shower/toilet combination room, but they get chilly. DM used Tivo sandals; I liked the watershoes I brought – waterproof, easy to get on and off, wearable with socks for warmth if needed. A Biffie – one of those lightweight knit loops of cloth that can be used as a headband, hat, neck scarf, or face-covering. When a sudden dust storm envelops you on the dusty trail across a dry riverbed, or a giant lorry passes you by, being able to cover your mouth and nose on short notice is a blessing.